Gildan men's regular leg boxer brief is made with premium soft cotton for all day comfort. Our solid colors are made with 100 percent cotton while our heather colors are made of 90 percent cotton and 10 percent polyester. 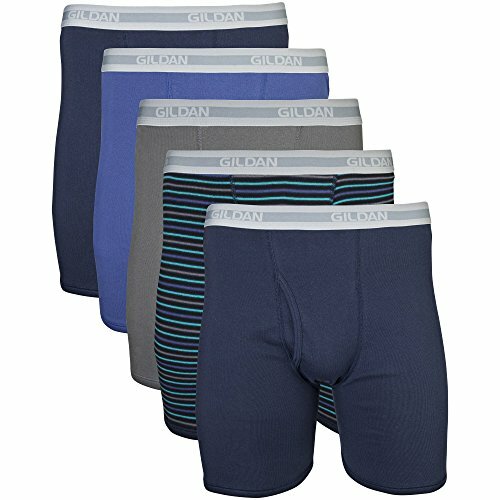 Gildan regular leg boxer briefs are manufactured with a 6 inch inseam. Our boxer briefs have a plush, non-binding soft waistband that keeps its shape even after washing. The boxer briefs are designed with a modern fit and also low profile leg bands that stay in place. We offer our regular leg boxer brief in 2 different color assortments. Sizes small through extra Large come in a pack size of 5 and size 2X comes in a pack size of 4. Be sure to check out our other amazing underwear products. We offer a stretch cotton boxer brief that is a cotton/spandex blend, a stretch poly boxer brief a poly/spandex blend and we now offer a 100 percent polyester boxer brief.